Education and Training organisations applying for Quality Council Accreditation must provide a comprehensive description of their systems and operations. Organisations must provide evidence that reflects precisely how quality is controlled and assured at all levels. 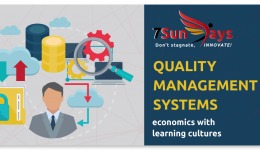 How to create and sustain a quality culture? How to ensure the relevance, comprehensiveness and clarity of standards used? How information about the workings of the organisation is collected, how often and by whom? How are learners’ needs actually met? How often are programmes delivered? How to ensure that facilitators possess the competence to both facilitate the learning effectively and assess learners in ways that are consistent with the NQF? How to ensure that learning and assessment activities are monitored and reviewed? How to ensure that feedback from reviews, audits and/or monitoring leads to improvements in activities? The mechanisms used to report back to people within the organisation? How to ensure that resources available are utilised effectively and efficiently, and are used to good effect? How to report to and generally relate to the ETQA under which you fall? Combining education, economics and creativity, Leonie can provide an innovative apprach to problem solving and strategy pain points.